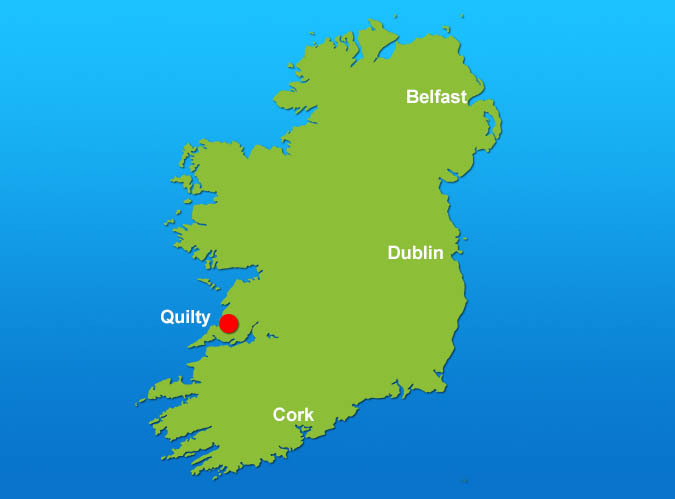 Quilty is a small village 20 kilometers south of the Cliffs of Moher with Mutton Island just off shore. The sculpted limestone landscape that we see above the surface is matched underwater by really impressive wall dives, pinicles and caverns. The area is rich in marine life with shoals of pollack, colonies of seals and anemonies packed onto every millimeter of the reef. We run several weekend Dive Safari trips to Quilty each year with dive packages covering one, two or three day options. We stay at the Quilty Tavern which has excellent B&B rooms with Pub food and great Guinness! The dives are very spectacular with depths ranging from 14 meters to 35 meters. The sites are suitable for all divers who have PADI Advanced level or higher and who have experience in colder waters (10 to 15 degrees Centigrade). Quilty looks directly West so it's also a great spot for enjoying some wonderful sunsets at the end of a day's diving. Each Safari weekend to Quilty is professionally supervised by the Dive Crew at Oceandivers, we operate the Ocean Voyager RIB from Seafield Pier with up to 4 different departure times on Saturdays and 2 departures on Sunday. We operate a full mobile filling station on the pier for cylinder charging. Due to the nature of the sites we visit, you will need to be certified to at least PADI Advanced level and be familiar with Irish style diving. The key details are listed below or for more detailed information you can download our Quilty Facts Sheet PDF here. * Please note that prices for Quilty trips on Bank Holiday weekends may differ. You will need to book your own accommodation and there are a good variety of options, most of us stay in the Quilty Tavern which also boasts a friendly Bar and good Pub Food.